With dozens of tiny diamonds arrayed in unique designs, pave-set rings have a phenomenal sparkle and fire. Choosing and taking care of these unique rings can be confusing, but expert tips can help. In this exclusive interview, Darrell Ross, president and CEO of Ross-Simons, shares his insights about the unique elegance of pave diamond ring settings and how best to care for them. LoveToKnow (LTK): It can be difficult for consumers to identify a pave setting just from looking. How is a pave setting different than a channel or invisible setting? Darrell Ross: The definition of pave is setting stones as close together as possible, so as to show the least amount of metal as possible. 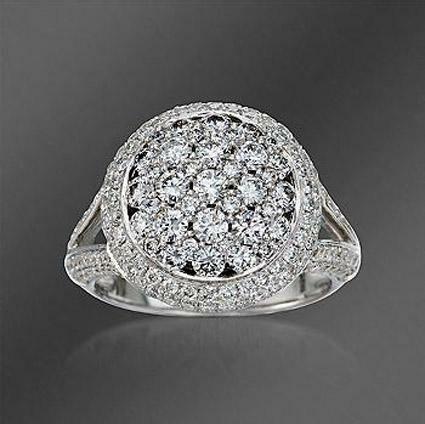 Pave is always round stones using smaller diamonds. A channel setting will show a space between stones if rounds are used. An invisible setting is for square or rectangular stones, such as radiant, princess, and emerald cuts. LTK: What are the most popular shapes for pave setting engagement rings? DR: Rounds, radiants, princess, cushion, and emerald cuts are the most popular shapes. LTK: Other than colorless diamonds, what gemstones are popular in pave settings? DR: Fancy colored diamonds, such as black or yellow, are commonly mounted in pave settings. The whole rainbow of sapphire is used; however, that's traditionally not on engagement rings. Sapphires are used more for fashion jewelry. LTK: There are beautiful pave settings in white gold, yellow gold, and platinum. What metals are best for pave diamond rings? DR: Platinum is the strongest. However, white gold is the most common and less expensive. LTK: How does the cost of a pave setting compare to the price of other multi-stone designs? DR: Pave settings consist of small round diamonds. Therefore, the pave mountings on average are an excellent value. When using fancy shape larger diamonds, they are more expensive. Of course, color, clarity, and cut of the diamonds, along with the metal used, always determine the price of any mounting. LTK: What can couples do to trim costs of a pave-set engagement ring to fit in tighter budgets? DR: Couples should always keep in mind the center stone should be the highlight of the ring. Too many or too large side stones can be a distraction from the center stone and will increase the cost of the mounting. Couples also should be sure the diamonds used to accent the center stone are a reasonable match for color and clarity. Colorless diamonds should never be used as side stones for a near colorless center stone. For example, if you were to set a 1.00-carat radiant H - SI1 center diamond with side stones having an E color and VS2 clarity, you would be paying for a higher color and clarity than you need and it would detract from the center stone. LTK: In some settings, gems are vulnerable to being lost. How easily do diamonds fall out of pave settings? DR: A pave setting is very safe and secure. There is no need to worry about their security. LTK: Is caring for a pave ring different than another style? What steps are necessary to properly care for a pave setting? DR: It's the same as any other jewelry. Rings, especially, should be inspected and cleaned by a professional jeweler at least once every three months. Most diamonds are lost when they are hit against a surface, snag on a fabric, or when the metal prongs simply wear down and are not inspected. Loss can be prevented by a simple inspection and minor repairs. If you select a pave-set engagement ring, you'll have lots of options. Whether you choose a diamond or another precious gem for the center stone and gold or platinum for the setting, you'll be amazed by the incredible sparkle of this type of design.